The following article is reproduced by kind permission. For upcoming events and services, please visit the Church Events diary page. This is a small church with many interesting features. Its origins are Norman or even earlier, though the Chancel was more recently rebuilt. The Font is of the period- with a square bowl, lead lining and slightly splayed angles. On the north side of the church is a Doorway of 12th century Norman workmanship. The dogtooth ornament in the moulding of the arch is evidence of the lateness in that period when the work was done. Later the lower part has been built up with the top having a leaded window. An old staple of the door can still be seen. Some of the Nave Windows, which are rudely cut, may be 14th century. The Arch of the Porch, the head of which appears to have been tampered with, may also have been of this period. The new Roof was added to the Nave at about 1878 during the incumbency of Rev W. Hamilton Nantes. The narrow Chancel Arch was formerly, as shown by the foundations, the same width at the base as it is just below the impost. The jambs have been cut away at some time and a pointed head substituted for the original Norman arch. The Reredos, moved from the altar to the Nave north wall, represents the crucifixion of the Lord. The inscription, in Latin, Greek and Hebrew, is "The nails, the spear, the scourge" It was a gift from the painter, John Gray. The Chancel was entirely rebuilt at the restoration of the church by the then Rector, Samuel Lane, in 1850. At the same time the Nave seems to have been restored and reseated with benches. The Pulpit and Prayer Desk were also rearranged and a small arch opened to give access from the Chancel to the beautiful Jacobean Pulpit. This, unfortunately, has been much cut about to fit it in and placed on the stone base. The Roof of the chancel is in two bays with the purlings each side having "diagonal" bracing in the 15th century style. In the south wall of the Sanctuary is an ancient Picina probably taken from the old chancel when it was rebuilt. The Altar is of stone with three panels. In the slab five black crosses, the gift of Rev S. Lane, are inlaid. There is only one Bell, small in size (diameter 18": height 12") hung in a cot and dated 1855. The Churchyard was enlarged in 1884 by land given by R, B. Sheridon. The church, dedicated to St Francis in 1988, formed part of a much larger village than is seen today. 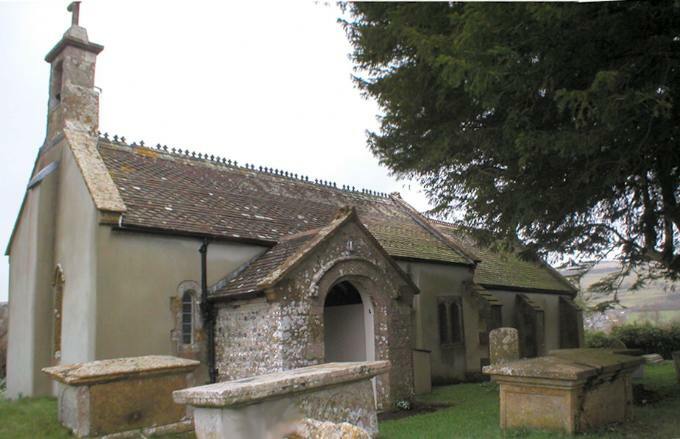 Its name derived from the Norman-French Vau meaning Val - that is to say, Frome Valley Church. The old Rectory, now Frome House, lies opposite the church.